Initially the film I was going to choose for my worst horror movie since the new millennium was FearDotCom. That is hands down the worst movie I’ve seen so far in my life. However, I’ve only seen it once, and I barely remember anything about it. Maybe that’s a good thing? So I moved on to the next worst film and that is the remake of The Wicker Man. 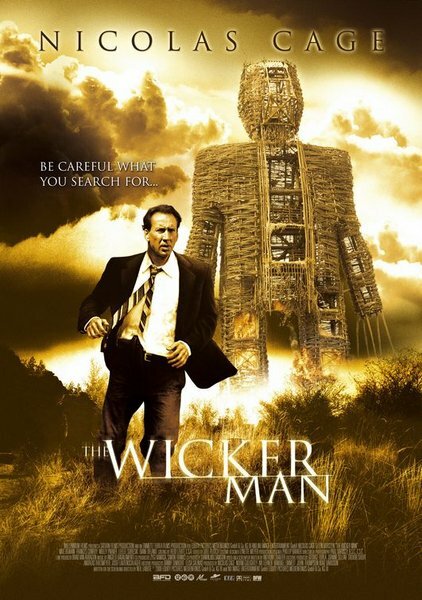 The Wicker Man (directed by Neil LaBute) is a remake of the 1973 film of the same name. It tells the story of Edward Malus (Nicholas Cage) who gets a call from his former fiancée Willow (Kate Beahan) saying that her daughter Rowan (Erika-Shaye Gair) has gone missing and she asks him to come help find her. Malus then travels to the island where Willow resides, the island is ruled by Sister Summersisle (Ellen Burstyn). As Malus’ search for Rowan escalates, he also begins to learn deadly secrets about the island and the women who reside on it. Upon seeing trailers and ads for the movie, I has a feeling this was going to be more of a mystery/thriller than a horror. Wow, I was even wrong there. This movie is so laughably bad. Not only is the acting horrible, but the characters and the situations that they find themselves in is hilarious. There is a scene with Nicholas Cage having a smackdown with Leelee Sobieski that one cannot help laughing their asses off. And it only escalates from there, even in the climax of the movie, where it’s supposed to be terrifying, hilarity only ensues. One moment involving Cage’s character dressed as a bear and doing some weird dance. There’s also the women of the island’s infatuation with bees that is just beyond stupid and laughable. Apart from the unintentional laughs, I did not feel sorry for any of these characters, they were either annoying or just plain dumb. In a way, I give it credit for providing huge laughs, but even then I would NEVER recommend this movie to anyone. I even stopped someone from renting it at the video store once. In a way the movie did have potential in the mystery aspect in the story, but everything piled into it just completely ruined the film.